We have some faux stone veneer panels available. Colors can be painted darker to any color and coated with a clear layer of UV paint. 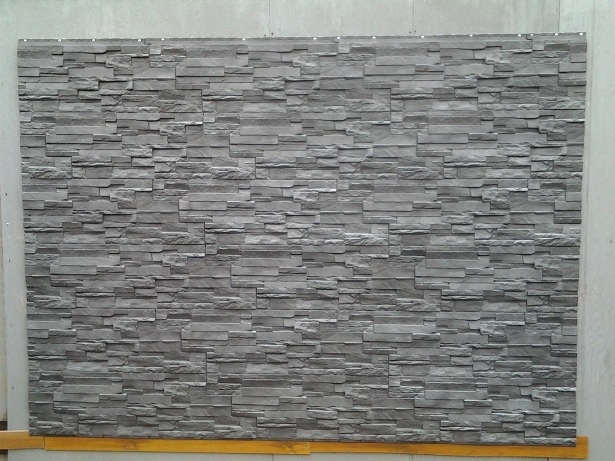 PU foam panels, PU ledgestone, faux rock decorative wall covering panels. Metal wall, ceiling, roof cladding panels. For both interior and exterior (indoor and outdoor) applications. Sample of an plastic veneer panel (texture only) Can make a mold and cast faux stone veneer panels with concrete, fibreglass, GFRC etc. 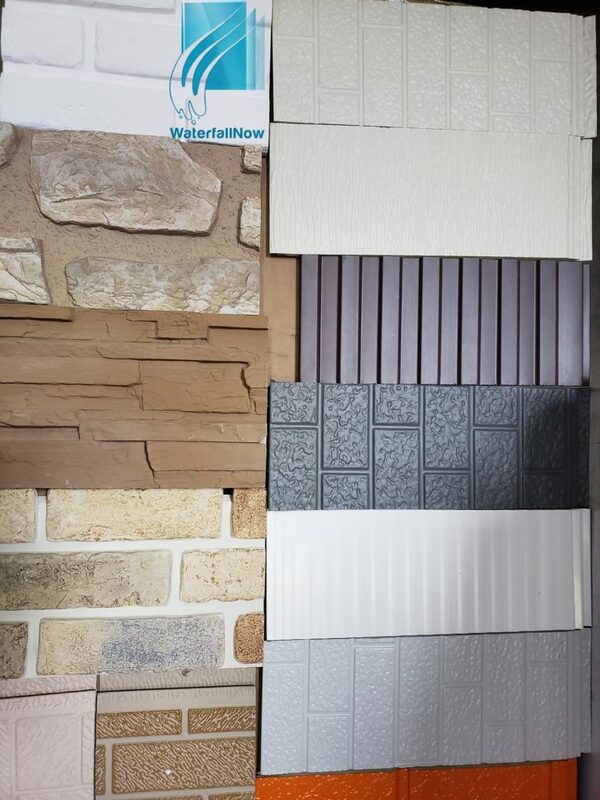 WaterfallNow can custom create any faux stone veneer panels for use in any application. These are an excellent choice for home construction for both indoor and outdoor applications. Not only do they look great but they last long, don’t fade, don’t crack, and don’t split. Use them on walls, around a fireplace, as a retaining wall cover, or even as part of a water wall feature. 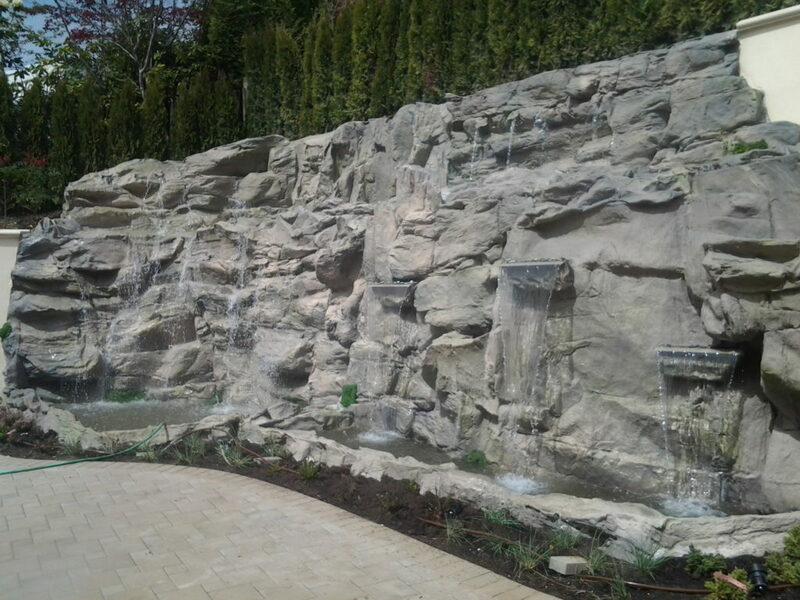 Because faux stone veneer panels do not require the customization of our rock water features they are something that we offer as is. Installation of veneer panels is easy enough. They are lightweight and don’t involve the hassle of carrying real stone. 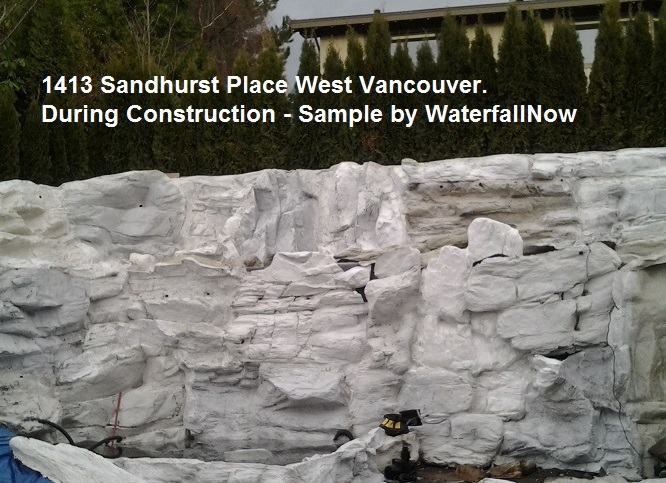 WaterfallNow can offer clients any style of faux stone veneer panels. Send us an idea or sample of what you would like and we can create some samples. Alternatively you can bring existing samples to us and we will re-create them for you. Fake rock veneer panels great and are increasing in popularity for a reason. They are a great addition to any renovation project – transforming the look and feel of any room. 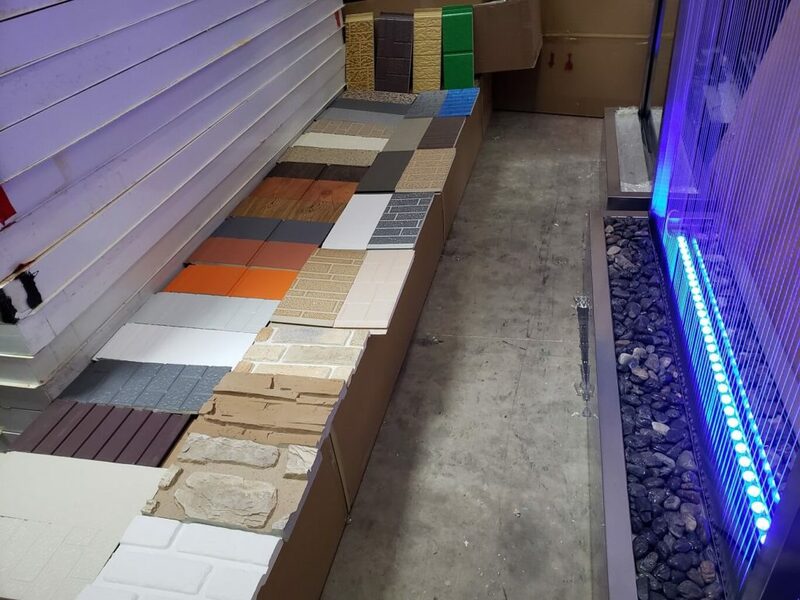 The rock colour, desired thickness, use of concrete or fibreglass, and even sizing can all be customized according to the clients needs. In some cases you may even find yourself spending less than a fraction of what you would have spent otherwise. WaterfallNow believes that some things are meant to change. Gone are the days of having to hire hundreds of different people to have something installed. Doing so cuts into the budget. Before you think ‘oh here we go another guy preaching how to cut corners,’ just hear me out. The cost of … Everything.. has gone up. It isn’t about cutting corners and taking shortcuts but maximizing the cost-efficiency of what you have to work with. This includes means paying more for energy efficient appliances or lighting. Just think long-term. This cost savings can ultimately be a benefit to the home-buyer. Builders especially, are looking to use their existing crews who they already trust to get the work done themselves. That is not to say that there aren’t problems associated with this as I will mention later. While most trades require skill and experience, respect must also be given to the growing DIY (do it yourself) movement. More homeowners, landlords, and builders are looking to save money and increase their returns on investment by investing their time more wisely. In certain cases it may take less than a few hours to install a false rock wall using faux stone veneer panels. 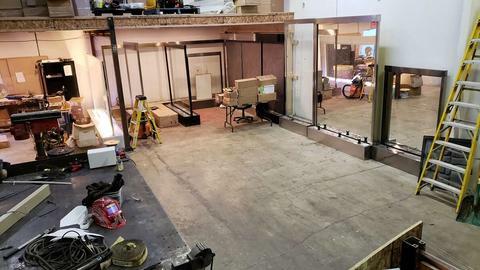 No mess and no damage to the flooring. They last long, look clean & uniform, and are easy enough for the ‘do-it-yourselfers’ to manage on their own. We like the idea of faux stone veneer panels and have employed their use on a number of applications. They are definitely a growing trend and are appearing on many new homes. We just ask that should you install these to ensure that you fill in the gaps. What I’ve been noticing in many new development projects throughout Surrey, Vancouver, and in other parts of the Lower Mainland is that sometimes these panels are not adhered correctly! Often on more than one house in a row! I should point out that faux stone veneer panels look beautiful but only when they appear natural. When a person cannot tell from afar or up close that they are made with faux rock panels it is generally a sign that the installer did a good job. If however a person can see from far away that the application is peeling away as I have seen then you may want to address that issue to prevent the same from happening on future houses. Faux Stone Veneer Panels are NOT a Shortcut!!! The combination of weathering from rain, sunlight, snow, and freeze-thaw can slowly warp or peel faux stone veneer panels that weren’t properly adhered away from the structure resulting in an ugly appearance. The result? It looks cheap and gives off an air of poor quality work to prospective homebuyers who will then view the rest of the home with even more skepticism. Would you not wonder yourself if those who built the home didn’t also cut corners on other parts of the home as well? Perhaps on the roofing or plumbing? I have learned a thing or two about sales and how to sell from being a customer. Selling homes just like selling a car, service, or a product is not about hard sales – which can lose you the sale. It is more about being consultative, providing great support, treating the client with a friendly demeanor, being honest, open, caring, and having a keen eye attention to the details. Ultimately the mantra that we buy from those who we ‘know, like, and trust’ holds true. Moreover, this is one of the reasons why profitable businesses are those that have a large referral base. Just as you would want someone else to go through some work you’ve done who can give you a fresh perspective you may also want to get a few close people to analyze your newly finished home. Better they see the flaws and you correct them before putting the home up for sale and risk damaging your reputation. While one or two small problems may not kill the deal they can certainly add up. Where there are a few there tend to be many. The industry professionals tend to have none altogether and they are the ones who can cater to a certain market of buyers that otherwise wouldn’t buy a home. It pays in the long-run to build things that will last for the long-term. Why? Because it can take 20 years to build a solid reputation and a just few minutes to destroy it for good. On a more positive note, if you need some veneer panels either fake or with real rock feel free to contact us. Our connections are yours as well. The following is a list of 20 retaining wall ideas gathered from around the web. Retaining walls are basically walls that are specially designed to hold soil on one side and remains free standing on the other. Why would you want a retaining wall? Retaining walls help to keep the soil or land from collapsing over. It is beneficial for areas with steep changes in elevation and can save space. If for example there is no retaining wall you would instead have a hill shape. Retaining walls help to give a landscape a neater appearance while also making a yard appear larger. Retaining walls may also be used on level ground for the purposes of creating elevated planting areas. They may also be used for designing fire pits. There are many different methods and materials that can be used to create retaining walls. Older styles of retaining walls typically include natural stones, bricks, or wood, but rarely a combination. Newer techniques gaining in popularily includes the use of concrete. Concrete retaining walls may be subject to cracking or erosion but created properly last many years. They often look the most aesthetically pleasing and are very sturdy. 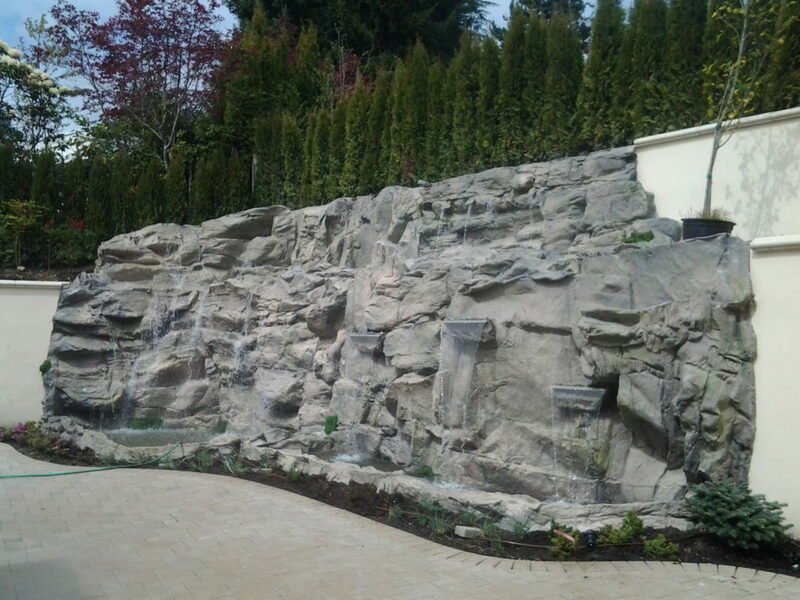 Those that live in an area with natural rocks may create a retaining wall by blasting the existing rock walls. Another option includes the use of fiberglass or precasted products. 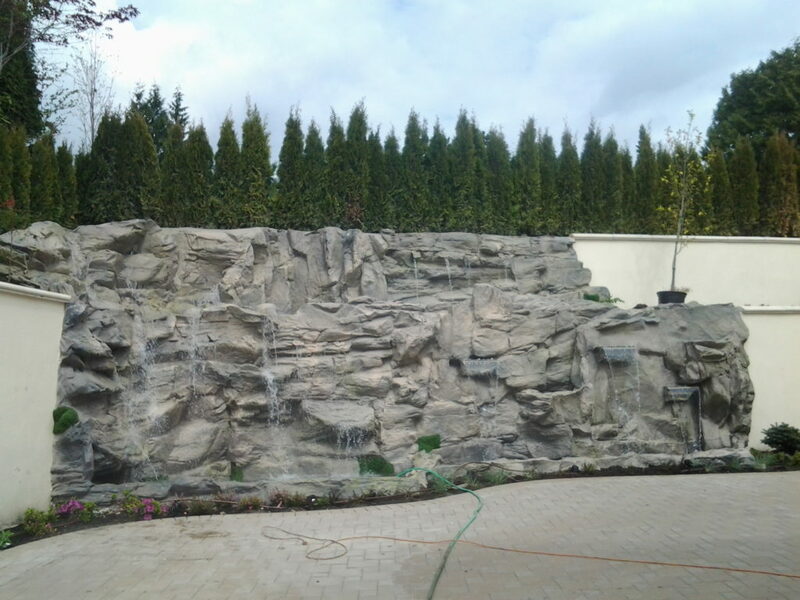 These can simply be placed over top of an existing brick or wooden retaining wall to give an appearance that there exists some natural rock features. It is a good idea to invest in a retaining wall that will stand the test of time. Ensure that the foundation for the wall is solid. Ensure that you consider all of the potential issues and address them accordingly. Slide 20 is a perfect example of what could go wrong.